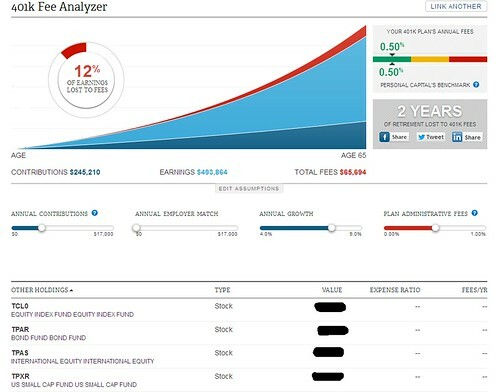 Personal Capital 401(K) Fee Analyzer Review: The free tool lets you check the overall costs of your 401(K) plan after you linked your employer sponsored retirement accounts to Personal Capital. It could be a valuable tool to plan what to invest in your 401(K) plan in the long term to reduce costs. For the Analyzer to analyze the costs, however, funds in the account need to have valid symbols, not those created by fund administrators for internal use. Are you concerned about investment costs, such as commissions, mutual fund fees, and any additional administrative fees? The costs to invest are always the No. 1 concern to me. That’s why I always look for stock brokers with the lowest commissions to trade stocks and mutual funds with less 1% fees to invest for the long-term (usually index funds have much lower fees than actively managed funds do), in both regular investment accounts and retirement savings accounts. Since there’s no way to totally avoid these costs, despite that mutual funds are getting cheaper to invest recently, the best I can do is to reduce the fees to the minimum so that the fees won’t eat a big chunk of my investments. This is especially true for retirement accounts. However, the problem for retirement accounts is that since I use mutual funds in my 401(K) and IRA accounts, the cost isn’t that as obvious as the commission fee that I was charged every time I trade a stock. Plus, I usually own multiple funds in my accounts and even though I know how much administrative fee each individual fund charges, the overall cost of the entire portfolio isn’t that clear. So I think it would be nice if there’s a tool to calculate the cost based on the funds I own and the value of each fund. Everybody knows that the less the fees, the more I got to keep for myself. The question is how to figure out exactly what I am paying right now across different accounts. The the expense ratios of the funds in your 401(K), which you can find in the fund’s prospectus. The plan’s administrative and advice fees. You should be able to find these fees in your plan statement as providers are recently required to disclose a fund’s administrative and advice fees. Unpublished fund fee data, which you should be able to find in the plan statment as required, even though this information is not publicly available. Since I am very eager to know my investment costs, I registered with Personal Capital and linked my 401(K) account at Fidelity. However, after playing it a little bit, I left disappointed because I didn’t get what I was looking for. The reason I am guessing is that funds currently held in my 401(K) account are particularly offered by my employer, so they don’t have the ticker symbols that normal funds do. And because of this, Personal Capital is not able to analyze that funds and figure out the Expense Ratio (ER) and the annual cost of owning those funds. Instead of telling me the true costs of my 401(K) plan, what I got was an estimated total costs over the years based on different ratios of Plan Administrative Fees (the second item in the above list that doesn’t include ERs), as you can see from the screenshot above. Since my two 401(K) accounts, and my wife’s account, are all made up with funds that don’t have standard symbols, I wasn’t able to find out the costs of my plans My employer used to offer Fidelity funds in the 401(K) plan, but later shifted to only custom-made funds. I am pretty sure there are plenty of people who can only invest in funds custom-made for them by their employers and it is a pitty if we couldn’t find out such important information as the total costs of our investments. Actually, if you look at the above screenshot, all it needs to calculate the costs are ERs plus administrative fees of the funds. Even though the funds in my 401(K) plan don’t have valid symbols, they do have the data availble for me to view. If Personal Capital allows me to manually enter the data into their Analyzer, then I will be all set and this tool will be more useful. This could be a simple solution for the problem. Of course, once you created a Personal Capital account, you can do more than just analyzing your 401(K) costs. In fact, it also lets you link regular investment accounts or even bank accounts so that you can view them all together. However, this function is not new. There are quite a few other tools can do that for you as well. For example, you can manage all your bank and credit card accounts using Mint and using Wikinvest I can track all my investments. But none of them analyze investment costs for me, so Personal Capital is quite unique. Are you using the 401(K) Fee Analyer from Personal Capital? If so, are you able to find out the overall costs of your plan? If you go self-directed with a retirement account, then you can invest with zero transaction or asset fees. This can be either as self-directed IRA or Solo 401(k). There are things that you can do to make sure you have a great time when you retire. This could be done through the use of retirement plans.